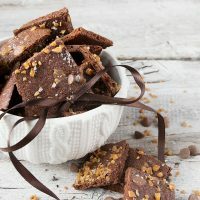 Delicious chocolate crisps, topped with toffee bits and flaky salt. Great for snacking or gifting! Having a Silpat or other silicon baking mat is helpful for this recipe.